I am saddened to inform you that Frosty Bear will not open this season. John Martin — aka Frosty — has hit some tough times, and must contract his operations. I think it’s been a 7-year run. John came to me in 2009 when, as a graphic artist, he was having problems finding jobs. He rented the gazebo and, at the same time, worked for an hourly wage at the cafe in the Darien library. He would rush to us at 2 p.m. in order to open every day. In time he bought the rights to the cafe, and opened a small ice cream shop in Monroe. His 2 daughters helped out in all locations. Frosty Bear at Christie’s Country Store, on Cross Highway. Selling ice cream is not easy, and many more well-capitalized folks have entered the business selling ice cream or frozen yogurt. Early last summer, John got tough news that his oldest daughter Lauren, who had just graduated from UConn, was diagnosed with MS. A month later, Alyson was having trouble scooping hard ice cream. She, a UConn student, was diagnosed with the disease as well. Our customers may have noticed that he had trouble staffing the gazebo this year, and this is why. It got a little worse when his wife Ann, broke her ankle. The challenges have just become too great for him to stay open. We are so sad to see him go. But you can find John at the Darien Library on the Post Road, and at 695 Main Street, (Rt 25), in Monroe. 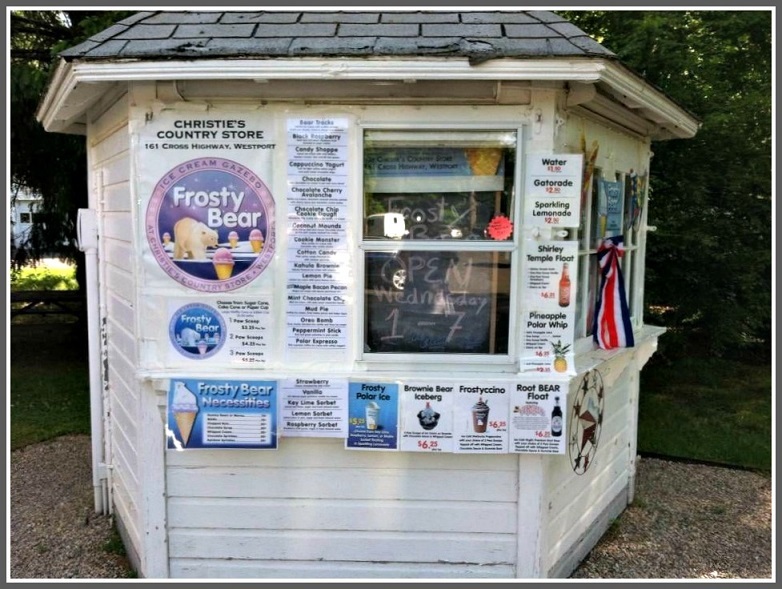 This entry was posted in Economy, Local business, People and tagged Christie's Country Store, Frosty Bear ice cream, John Hooper. Bookmark the permalink. Wow I grew up with Christie’s being our neighborhood place. I realize it’s really tough to run a small retail place, especially in an out-of-the-way location. But I recently drove up there and noted how unattractive and uninviting the exterior of the building has become. Plastic sheeting over the porch, and all those loose paper signs on the gazebo, for a start. Christie’s was never a “shi-shi” establishment, but could the current owners at least restore its original appearance as a neatly kept country store. Oh, how awful for this family to have two daughters diagnosed with MS (and even more awful for them, at the same time). Horrible about the wife’s broken bone too, but at least that is able to heal and she is better. It’s too bad that he has had so much trouble in staffing the store. I used to love going to Christies on a regular basis, but then the owner of the country store started to get very strict with the clientele about not being able to stay too long if they had finished eating and were chatting with eachother for more than an hour or doing some work while waiting for their car to be serviced, even when the rest of the place was empty or almost empty. The food is great and the service was usually very good, but he made it very uncomfortable to hang out to eat the food we bought. It felt unwelcome when it used to be such a sweet and welcoming place. I’m not sure if he felt he had to do this because he thought he would be able to sell more food if people were sitting at the tables for only a short time. But he lost lots of business by doing this from some regulars who would meet there for breakfast almost every day and now never walk in the door anymore. Peter, I havent seen you since Coleytown. How are you? I agree the winterization is not the most appealing but it does keep the cold out for the customers. I assure you the inside is much more attractive, love to catch up. John took down the Frosty Bear signage in August. Also, I’m sorry I read so quickly as to miss the health issues facing John Martin’s family. I’m especially sorry if it’s the same John Martin I knew from Banana Design on Franklin Street; we worked together in the same building. I wish John, his wife and daughter strength and success in managing an extremely difficult situation. Very nice of you to say Peter, its a great family. I just spoke to John yesterday. His kids are doing well and Alyson is doing great at UConn. There are a number of tables on the porch and with the sun streaming in people do eat out there in this cold weather, in the afternoons the kids enjoy the space and ability to run around. Christie’s isn’t closing, just the ice cream stand. I’m sure others readers feel the same way. If anyone has any ideas, please post them here as comments. Thanks. What a terrible tragedy. Please let your readers know if any opportunity to help the Martins is contemplated or perhaps Mr. Hooper might create a fund for them at the store or other assistance if needed (I don’t want to assume it is)? As a suggestion for the kiosk, perhaps Mr. Hooper should reach out to Sergio over at Sunny Daes and see if he’d like to jump in. He’s a great guy and might be able to get in for the season. Perhaps if that works a fundraiser (again if needed) might be arranged with Sergio. All else aside the Martins are in our prayers. Dan, I am willing to coordinate whatever people wish. I agree — If there is a way to help the Martins, I’m in. What devastating events! It’d be great if we could find a way to run the kiosk to benefit town organizations, especially with its proximity to Bedford, Staples, the athletic fields and Wakeman Farm. Maybe the folks at Wakeman could run it over the summer or the Rotary or PTA. Anyone have any ideas? Oh, and 06880 readers … please read Dan’s stories closely before responding. Criticizing Christie’s was unnecessary. Oh, and so was that last paragraph. Agreed. They were making it sound like Christie’s was closing. This is REALLY a sad story!! idea. Closing the stand will be a serious loss for the area.